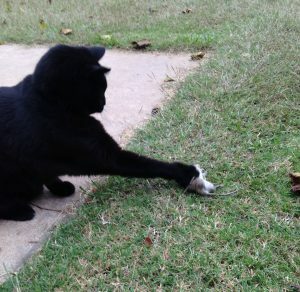 Lucky…with his brother Baby’s catch (He knew Baby is the better hunter). Lucky (r) and his brother Baby. 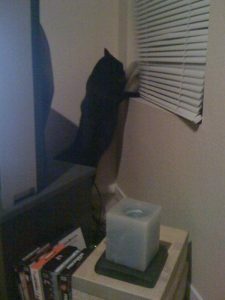 Lucky batting at the blinds…anything to make some noise & get your attention. Lucky helping me getting ready in the am. He passed away rather unexpectedly. I had taken him to the vet on Tuesday and his blood work looked really good for a 16-year old cat. 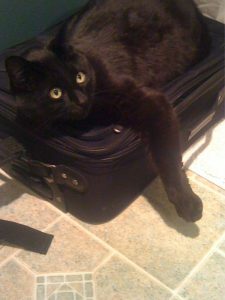 The vet diagnosed him with Stage 1 kidney disease and we devised a treatment plan. He expected Lucky to live another year. Lucky had it rather rough that night and come Wednesday morning, I knew the end was near. I wrapped him in a towel and drove to the vet with him on my lap. Lucky and his brother Baby came to me 16 years ago while I was living in Washington state. A friend in Oregon found an abandoned cat in the woods by her house. She took the cat home and realized it had been nursing. She went back to the spot in the woods where she discovered the mama cat and found four kittens. I drove to Oregon and took home the biggest one (my Lucky) and the runt (my Baby). I thought “Lucky” was a perfect name for my new buddy as my friend had the hindsight to go back into the woods and search for kittens. Turns out I was the lucky one. We are all lucky to have four-legged friends cross our paths and share our lives. The live forever in our hearts and memories. Goodbye my sweet buddy. Thanks for letting me be lucky enough to have shared a part of my life with you. This entry was posted in Animals, God's creation and tagged lucky kitty. Bookmark the permalink. Very sorry for your loss. Our furry babies are like our kids. Sometimes you’ll feel as if he is there, why not? He gave you the best sixteen years of his life, You were both “Lucky”. So sorry you have lost your beloved friend and Cat Lucky at the age of 16. My 2-year-old boy cat Flash looks so much like Lucky. I tell Flash, “If you weren’t here, I’d be talking to myself”! Flash wears a collar because he goes out and I don’t want some idiot thinking he’s a stray and “adopting” him. He’s already taken! So glad you had so many good years with Lucky, hope it will console you that you gave him such a loving home. What sweet pictures of your cats. I’m so sorry Lucky had to leave before you were ready, but then, are we ever really ready to lose our human and animal family and friends? I am so sorry for your loss. 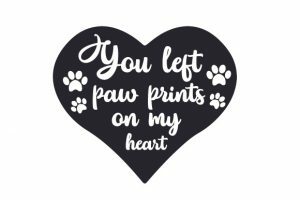 Our pets are so much of our lives and losing them leaves a big hole. He was a beautiful cal, RIP Lucky. travel well across the Rainbow Bridge…. Choked, quiet tears in sympathy with your loss. I’m so very sorry. I’ve been there, it hurts. Last year we lost our beagle of fifteen years to kidney disease. A month later I awoke to find my lab dead on the stairs. He was sixteen. I think he died of old age and a broken heart. He missed his buddy. We now have two puppies and a rescue dog. I’ll never forget my Milo and Simon, but that’s how it is with animals and humans. We’re only here for a time and then we move on. We leave the living to remember us. Beautiful sentiment, and I’m sorry for your loss. Lucky lives on in your heart and memories. I am so sorry for your loss. 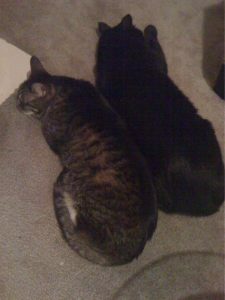 I have a cat and I always say ” I love you buddy to him”.When you said those were your last words to Lucky, I lost it. Condolences DCG, hopefully you’ll see that kitty again at some point, when evil is put to an end. I am so sorry to hear of your loss. It is truly one of the hardest things in life to lose a loved one, be it humans or animals. In this past year, I have lost three, with one being my loving wife of 45yrs. Each death hurts in so many different ways. We are sorry for your loss. We too lost Laverne and Shirley several years ago. No matter what one says about animals, they are family from day one. God Bless. Big hug to you DCG. 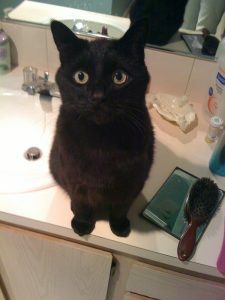 I lost my 15 yr old cat Morgan earlier this year. Half the time he slept at my feet or on my legs, the other times up by my pillow. Lucky was a lucky cat to have found you and enjoyed a life of being loved. My condolences. Lucky is waiting for you at the rainbow bridge. Thank you all for your kind words and sharing your stories.I truly appreciate it. I’m so sad and sorry to hear this, DCG. Heartfelt sympathy. My sweet Miri passed on this July. I recently adopted Violetta and her funny ways have brought new joy into my home. Every cat is special and your Lucky certainly had a special “mama.” Take comfort in knowing that you gave Lucky a wonderful life in a loving home. It’s all they ask; it’s all we can offer. Love ~C. Sorry to learn of your loss, DCG. Losing a beloved pet is like losing a member of the family.